Mobile App Marketing Strategy do’s and don’ts, and more! You are already part of the shift to mobile and you are living it. Our eBook on the mobile experience will expand your knowledge base, fill in some blanks, and show you a perspective you may not have considered. Mobile is not going to be a hot topic, it is THE hot topic. As a mobile user yourself you get it, but do you have the whole picture? While some mobile truths are very clear and self-evident, we would like to share additional information that can really get mobile to work for you. Marketing efforts today must include a plan to reach out to customers via mobile. Businesses and brands that don’t do this, unfortunately don’t have a competitive plan. So how to get there from here? This eBook tells you what you need to know and at the end you’ll find an easy-to-use solution for every business to meet their customers where they want – in the palm of their hand on their mobile device. 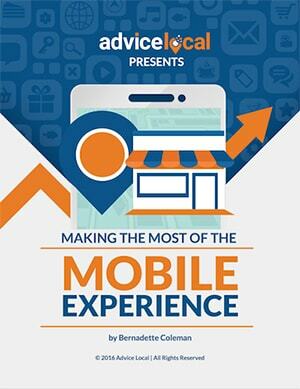 Downloading “The #Mobile Experience” eBook. Thanks @Advice_Local and @BernieColeman!